Diversion Investigators are responsible for scheduled investigations and unannounced audits of registered handlers of controlled substances to ensure that proper recordkeeping procedures are being followed. Improper prescribing can lead to the suspension of the registrant's license. From the passage of the Harrison Narcotics Act in 1914 right up through modern day, various laws and regulations have been passed by the federal and state governments to regulate and control the manufacture, distribution and dispensing of medicines. This system of regulations has evolved over time to address changes in technology, use and abuse patterns, and the emergence of new pharmaceutical products. Today the Controlled Substances Act and the DEA Office of Diversion Control work to ensure that medicines are available for the public while no illegal diversion takes place within the system. Prior to 1900, pharmaceuticals with a potential for abuse were not governed by special rules and regulations. By the early 1900’s it had become apparent that the over-production and unrestricted sale of narcotics was seriously undermining the health and social and economic welfare of many persons. The Federal Pure Food and Drug Act, passed in 1906, greatly reduced the use of narcotics in patent medicines but their easy availability from other sources made it clear that some action had to be taken to bring narcotics firmly under governmental control and that international regulation of production and distribution would be needed to make domestic control effective. Our country’s first anti-drug laws were enacted in 1914 with the Harrison Act. This law is known for establishing the foundation of federal drug law enforcement. Essentially, this law was a revenue measure providing for the registration and taxation of those who manufactured or distributed opium, morphine, heroin, or coca products. The law specified violations for failure to register or keep records and made it unlawful for anyone who had not paid the required tax to have these drugs in their possession. The Bureau of Narcotics, under the direction of the Treasury Department, was given the duty of regulating, supervising and controlling the trade in narcotic drugs and marijuana. The Marijuana Tax Law of 1937 placed a tax of $100 per ounce on the sale of marijuana, the Contraband Seizure Act of 1939 gave federal agents the right to seize any vehicle that was illegally transporting marijuana and the Opium Poppy Control Act of 1942 made it illegal to grow opium poppies without a special license. The years between the 1930s and 1940s saw significant developments in governmental attempts to control narcotics as they related to pharmacies. The Uniform Narcotic Drug Act of 1932 was enacted in many states and it defined narcotic drugs as well as made it unlawful for any person to manufacture, possess, have under control, sell, prescribe, administer, dispense or compound any narcotic drug except as authorized by the act. In 1951, legislation was proposed to remove barbiturates from the general coverage of the Federal Food, Drugs and Cosmetic Act and bring them under controls similar to those of the Harrison Narcotic Act. In 1965, with the enactment of the Drug Abuse Control Amendment, the government began regulating the sale of depressant, stimulant and hallucinogenic drugs. It also required that inventories be taken and records be maintained for at least three years. Thus the federal government worked to protect the public’s health by placing special controls on barbiturates, stimulants, and hallucinogens. The Comprehensive Drug Abuse Prevention and Control Act of 1970 replaced all preexisting laws regulating the importation, dispensing and administration of narcotics, depressants stimulants and hallucinogenic drugs. In an attempt to centralize the enforcement of this act the President created the DEA in 1973 out of BNDD, elements of the Bureau of Customs, Office of Drug Abuse Law Enforcement (ODALE) and the Office of National Narcotics Intelligence (ONNI). In 1976 the DEA established the Office of Compliance and Regulatory Affairs. The office was created to provide oversight for the specialized workforce that could focus exclusively on the diversion of legitimate drugs and take full advantage of the controls and penalties established by the Controlled Substances Act. DEA has been successful in regulating manufacturers and distributors as well as doctors and pharmacies at the retail level. The Controlled Substances Act (CSA) of 1970 and the Controlled Substances Import and Export Act are the legal foundation of the U.S. Government’s fight against the illegal use and distribution of drugs and other substances. These laws are a consolidation of numerous laws regulating the manufacture and distribution of narcotics, stimulants, depressants, hallucinogens, anabolic steroids and chemicals used in the illicit production of controlled substances and listed chemicals. The CSA places all substances which are in some manner regulated under existing federal law into one of five schedules. This placement is based upon the substance’s medical use, potential for abuse and safety or dependence liability. The changing of drugs within a schedule can be initiated by DEA, a drug manufacturer, the medical community, public interest groups concerned with drug abuse, state and local government agencies and the individual citizen. The following factors are required to be considered when determining which schedule a drug or substance should be placed in. The CSA was amended by the Comprehensive Crime Control Act of 1984 to include a provision to allow the DEA Administrator to place a substance, on a temporary basis, into Schedule I when necessary to avoid an imminent hazard to the public’s safety. Additionally, when there have been natural acts of Mother Nature, such as floods, and hurricanes like Hurricane Katrina in 2004, the DEA has made it possible for the effected public in that area to receive their needed medicines and prescriptions. A new class of substances was brought under federal control by the Drug Abuse Act of 1986. Analogues have the same chemical basics as a controlled substance and also have the same effect on the body. These substances are structurally or pharmacologically similar to Schedule I or II controlled substances and my have no legitimate medical use. These substance analogues are treated as a controlled Schedule I. Any person who handles or intends to handle controlled substances must obtain a registration issued by DEA. A unique number (DEA Number) is assigned to each handler of controlled drugs to include importers, exporters, manufacturers, distributors, hospitals, pharmacies, practitioners, mid-level practitioners, researchers teaching institutions and narcotic treatment programs. This number must appear on all prescription forms and it must be made available to the supplier by the customer prior to the purchase of a controlled substance. Thus, the opportunity for unauthorized transactions is greatly diminished. Registration for manufacturers, distributors must be renewed every year and for all other practitioners and handlers the registration must be renewed every year. The CSA requires that complete and accurate records be kept of all quantities of controlled substances manufactured, purchased or sold. Each substance must be inventoried every two years. From these records it is possible to trace the flow of any drug from the time it is imported or manufactured, through the distribution level to the pharmacy or hospital that it is dispensed from and then to actual patient who received the drug. The existence of this requirement is usually enough to discourage forms of diversion and serves large drug corporations as an internal check to uncover illicit diversion or pilferage by employees. Records for Schedule I and II drugs must be kept separate from all other records and records for Schedule III, IV and V substances must be kept in a readily retrievable form. Class B registrants (manufacturers, distributions, researchers, analytical laboratories, importers, exporters and narcotic treatment programs) are to ensure that they are properly handling all schedules. Schedule I and II drugs require that the supplier must have a special order form from the customer. This order form, DEA Form 222, is issued by DEA only to persons who are properly registered to handle Schedule I and II. The forms are preprinted with the name and address of the customer. The drugs must be shipped to the name and address to ensure that only authorized individuals may obtain Schedule I and II drugs. Another benefit of this form is the special monitoring it permits. The form is issued in triplicate so that the customer keeps one copy, two copies go to the supplier who then after filling the order keeps one copy and forwards the third copy to the closest DEA office. The supplier in each case is under an obligation to verify the authenticity of the customer. The supplier is held fully accountable for any drugs that are shipped to a purchaser who does not have a valid registration. Both manufactures and distributors must report the quantity and form of all their transactions or controlled substances listed in Schedules I and II and narcotics listed in Schedule III. Manufacturers and distributors enter this date into a system called the Automated Reports and Consolidated Orders System (ARCOS). This enables the DEA to monitor the distribution of controlled substances throughout the country to identify retail registrants that receive unusual quantities of controlled substances. The dispensing of a controlled substance is the delivery of the controlled substance to the ultimate user, who may be a patient or researcher. Special control mechanisms work to ensure that Schedule I drugs are only used in the United States for research. They are supplied by a limited number of firms to properly registered and qualified researchers. Controlled substances may be dispensed by a practitioner by direct administration, by prescription or by dispensing from office supplier. Records must be maintained by the practitioner of all dispensing of controlled substances. Many states require the use of triple copy prescriptions for Schedule II and other specified controlled substances. DEA registrants are required to maintain certain security for the storage and distribution of controlled substances. Manufacturers and distributors of Schedule I and II substances must store controlled substances in vaults or safes to provide adequate security of all storage areas. 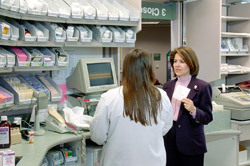 Hospitals and long term care facilities use single dosage unit blister packs and automated dispensing machines to ensure the closed system remains untouched. The rise of the world wide web over the past two decades has led to many useful advances in public access to information and products. Making medicines available to the public has also become easier. With that ease has come the challenge of making sure that the controlled distribution system that regulates “brick and mortar” pharmacies and their distribution chain also applies to virtual pharmacies operating on the internet. Many DEA Diversion operations have been launched in recent years that have targeted illegal rogue pharmacies and their money laundering schemes. Recently there has been a growing push to investigate diversion of controlled substances involving the use of the Internet. This rapid changing environment and an increase in Internet diversion of controlled substances created a need for additional investigations to target sources of diversion. The online pharmacy’s role in the health care system is constantly growing. Internet pharmacies can endanger consumers by dispensing “unproven, counterfeit, defective or inappropriate drugs”. Some Internet pharmacies actually serve a useful purpose by providing lower costs, added privacy and convenience. The traditional pharmacy is an online internet pharmacy run in conjunction with brick-and-mortar pharmacies, such a Walgreen’s, Rite-Aid, CVS, Rexall and Wal-Mart. The second type is a Illegal or “rogue” Internet pharmacy which first asks the consumer to complete a questionnaire considered an online consultation. Next, a physician reviews the questionnaire and then writes the consumers prescriptions based upon their answers. A problem with this type of online pharmacy is the lack of patient-physician interaction. Additionally, the questionnaire has preselected answers which the consumer needs to select to receive prescription, essentially making the online consultation a sham. Direct-to-consumer advertising of prescription drugs by pharmaceutical companies has likely led to the rise in the popularity of Internet Pharmacies. In an attempt to bypass the physician, pharmaceutical companies have started aggressive advertising campaigns to convince patients they can self-diagnose and self-medicate their ailments. The United States makes up 5 percent of the world’s population, but it accounts for 42 percent of the world’s spending on prescription drugs—more than $250 billion in 2006. The average TV viewer is bombarded with an estimated 10 prescription drugs ads per day and 64 percent of American homes have a regular user of prescription drugs. The DEA as issued guidance on Dispensing and Purchasing Controlled Substances over the Internet which states that individuals cannot purchase controlled substances from foreign Internet pharmacies unless the pharmacy is registered with the DEA as an importer of controlled substances. The DEA requires that drugs can only be sold with a valid prescription. States are responsible for regulating the practice of medicine within their respective borders. Most states have passed statues creating agencies to license or register the practice of medicine and pharmacy. Additionally, states have created standards of care for health care professionals through common and statutory law. All registrants must be registered within the state they are working in as well as the DEA. Trained for many weeks at the DEA Training Academy at Quantico, Virginia, the DEA Diversion Investigator is the critical link in the enforcement of regulations on controlled substances. From routine inspections of pharmacies and manufacturing plants, to building cases against complex international smuggling organizations, the Diversion Investigator works across the country and around the world in partnership with other criminal investigators to ensure the controlled distribution system for medicines is maintained. DEA employs over 500 highly trained Diversion Investigators (DIs) who work in over 80 offices throughout the United States and overseas. Diversion Investigators are responsible for scheduled investigations and unannounced audits of registered handlers of controlled substances to ensure that proper recordkeeping procedures are being followed. Improper prescribing can lead to the suspension of the registrant’s license. DIs work closely with DEA Special Agents and state and local law enforcement officers. Diversion cases cover a range of instances over the mishandling of controlled substances by registrants. These investigations can lead to the suspension of the registrant’s license, civil penalties, and criminal charges.